Use every time you plant trees, shrubs, Roses, annuals and perennials to stimulate early root formation and stronger root development. 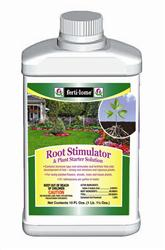 Reduces transplant shock and promotes greener, more vigorous plants. B-1, Indole Butyric Acid and a wetting agent. Flowers, shrubs and trees: 3-1/2 tablespoons per gallon of water. Mix 1-8 pints per plant transplanted.